Readers may be aware that Rishi Kapoor is currently in New York for a health treatment. The actor had announced about going to the Big Apple on social media but refrained from giving out too many details. But recent pictures shared by fans have been showcasing that the veteran star’s health is improving. While concerned fans have been receiving updates about his health in posts shared by Neetu Kapoor, the yesteryear actress recently shared a picture of Rishi Kapoor and Ranbir Kapoor that was heart-touching. Neetu Kapoor shared a picture of Rishi Kapoor walking with his hands resting on the shoulder of their son Ranbir Kapoor. She captioned the same calling it ‘cycle of life’. She said, “When roles are reversed #cycleoflife #gratitude #faith.” Well, the beautiful picture captures the changing dynamics of a parent-child relationship, indeed! 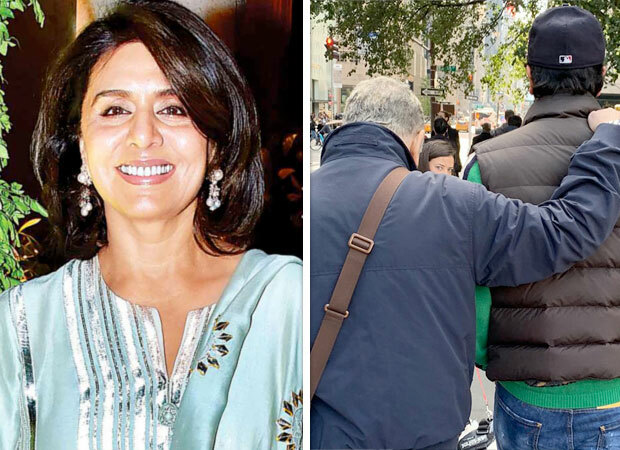 Although initially only the Kapoor couple had taken off to the U.S, recently their son Ranbir too joined them in NYC. It was being said that his girlfriend Alia Bhatt too had taken to the Big Apple to spend some time with the Kapoor family. Besides them, many Bollywood celebs like Priyanka Chopra and Sonali Bendre, who is currently residing there for her cancer treatment, decided to meet Rishi Kapoor and Neetu Kapoor. Pictures of the same too were shared by the yesteryear actress. When Rishi Kapoor had announced on Twitter about taking off to New York for his treatment, many fans expressed concern. And when photographs started surfacing on social media, fans were worried to see Rishi in grey hair but the veteran actor soon responded adding that it was just a look for one of his upcoming films. On the other hand, Ranbir Kapoor is currently working on the ambitious superhero drama Brahmastra which features him alongside Alia Bhatt. The actor has also signed Shamshera with Sanjay Dutt and Vaani Kapoor and also an untitled Luv Ranjan film with Ajay Devgn.